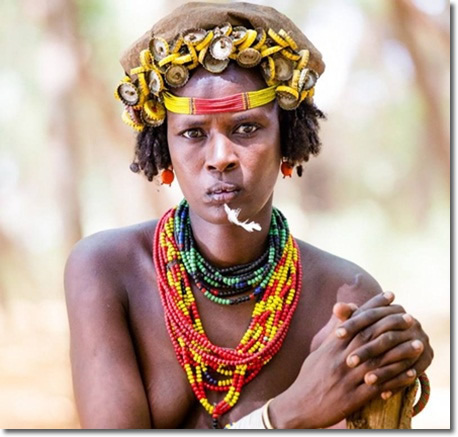 The Dassanech people (also spelt as Daasanach, Dasenach, and Dassanetch, and called Geleb,Merile, and Gabarich), who speak an East Cushitic language, live in Ethiopia and Kenya on the northern shore of Lake Turkana and further north along the Omo River. The name Dassanech means ‘People of the Delta’. The Ethiopian Dassanech (the majority) live in DassanechWoreda (District), South Omo Zone, Southern Nations, Nationalities and Peoples Region (SNNPR). The population of the Ethiopian Dassanech is estimated at 48,067 (CSA 2007: 84). According to unpublished data from the South Omo Zone Administration, the land area of the Dassanech is 2,575 sq km. Until 2006, the area was part of the administrative unit of Kurazworeda. Following the 2006 administrative restructuring,Dassanech land was elevated to a district level with its capital at Omorate, some 852 km south of Addis Ababa. The Dassanech district is divided into 40 units called kebele. A kebele is the lowest administrative unit responsible for government functions such as local administration, the collection of tax, provision of extension service and food aid, elections, etc. Except for Omorate (the capital of the district), which hosts migrants and local people, all other kebeles are inhabited by agro-pastoral Dassanech communities. Traditionally, the Dassanech are divided into eight territorial sections (emeto). These include the Shirr, Inkoria, Narich, Elele, Riele, Oro, Randal, and Kuoro. Despite the recent re-organization of the Dassanech society into ‘modern’ administrative units by the government, the emeto structure remains strong and functional throughout the Dassanech territory. Territorial sections, which are seen as identity markers of the residents, are autonomous in terms of managing internal affairs such as resource use, transfer of generational power, religious/ritual functions, offensive/defensive actions, raiding, and conflict resolution. Furthermore, the Dassanechare divided into eight exogamous and non-territorial clans (turo), namely, Turinyerim, Fargar,Galbur, Turat, Ili, Mur, Edze, and Tiyeme. The clans reside in all territorial sections, although each section may not have all eight clans. Today, the Dassanech people are predominantly agro-pastoralists, who complement their income from livestock production with cultivation of crops on the flooded banks of the Omo River and fishing. The Dassanech claim to have lost much of their lands to Kenya in the south and in the west during the last century. The loss of land translated to massive decreases in the numbers of their livestock, which forced many people to adopt alternative livelihood strategies: cultivation and fishing.